2 bottles of superb extra virgin olive oil. 750ml of Organic Italian Oil and 1000ml of Greek PDO oil from Kalamata. La Molazza Organic Extra Virgin Olive Oil is made predominantly from Dolce di Rossana olives which yields a thick, soft oil with a mild almondy flavour. 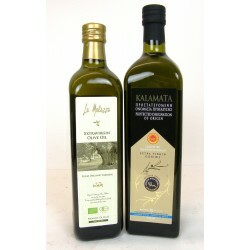 Kalamata Extra Virgin Olive Oil. P.D.O. oil produced exclusively in the Kalamai province of Messinia with a distinctive light, fruity flavour. Made from Koroneki olives.